Benelli, one of the oldest motorcycle makers in Italy is coming to India. DSK, the same Pune-based house that is Hyosung's partner in India is going to be the Indian partner for Benelli. We have confirmation that the announcement is scheduled for October 17, 2014. OVERDRIVE will be reporting live from the event - follow us on Twitter (click here to follow us on twitter or like our page on Facebook to ensure you don't miss any of the details.) Our sources tell us that DSK and Benelli have big plans for the Indian market and Benelli intends to disrupt the perception and affordability in the big bike market in India. We believe that the DSK-Benelli operation and the DSK-Hyosung operation will be two entirely separate entities, though they will both be controlled by a small group of top level executives. In that sense, DSK-Benelli does not affect DSK-Hyosung in any significant way. DSK's involvement with Hyosung of Korea and Benelli of Italy should run parallel to each other. The difference in appeal, position and nature of the two sets of product ranges means that the prospect of competition and cannibalisation within the DSK 'families' should not be an issue at all. But this also implies that the marketing, sales and crucially, distribution will be unique to Benelli. 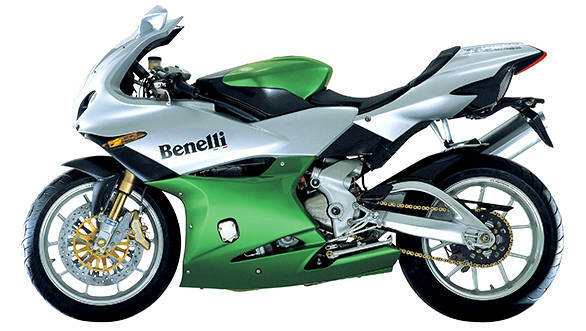 DSK will probably create new teams and new dealers to handle Benelli in India. What will be common are some of the back-end operations, like human resources or payroll, for example. We do not believe DSK will adopt the easier option, which is to rebrand Hyosung showrooms to carry both brands. This is not unheard of - Triumph and Harley-Davidson, to wit, have appeared in common showrooms in many places because the two brands don't directly compete with each other. DSK has shown with Hyosung that they aren't afraid to expand the product range and we believe the same will be true for Benelli. The Italian manufacturer is now owned by a Chinese company - Qianjiang. Sort of like Indian Motorcycles, Benelli has also had a rocky past with multiple resurrections. But the Chinese moved in back in October 2005 when they purchased the Benelli operation, based in Pesaro, Italy from the Merloni Group. They've been pretty stable ever since. The Merloni Group - the owners before Qianjiang - created most of the current range that includes the Tornado (Tre) sportsbikes and the stunning TNT nakeds. The new BN range of naked motorcycles was unveiled after Qianjiang took over the reins. Today the range spans 300cc to 1130cc and we are likely to get them all. Better yet, we believe that while it is expedient to rush everything to market by any means possible - CBU, SKD, CKD - DSK and Benelli will assemble all the bikes here, including the 600cc inline fours and the big triples. It's this assembly and the consequent duty implications that will disrupt the current price continuum in the nascent but growing big motorcycle space in India. Yes, that does mean that the 1130cc triple cylinder engine which powers motorcycles like the Tre K (adventure tourer), the Tornado sportsbike and the TNT sport-naked as well as the 899cc version of the TNT will go into assembly by our reckoning. So far, manufacturers have tended to assemble what needs homologation, preferring to CBU import whatever falls above the 800cc (paperwork only) limit. We are hoping this becomes a trend that brings sportier machines to more affordable prices. DSK already assembles Hyosung's 600+cc twin cylinder engines here and adding a new assembly line to their plant to ensure the Benellis are sent to the showrooms at great prices should not be too hard to achieve. DSK-Hyosung have still to reach the levels of scale where their strategies cause the bigger manufacturers to reexamine their plans. But that doesn't mean that DSK-Hyosung's strategies haven't worked. They have regularly beaten their own sales expectations. Despite the fact that Hyosung's products today do reflect the corporate turmoil that the company has gone through before the arrival of S&T brought stability and a restart of serious product development. By the same ken, Benelli isn't an earth-shatteringly large motorcycle maker or a vitally important cog in the global motorcycle business. But under the Chinese owners, Benelli have steadily expanded their range and the current line-up is pretty comprehensive. The reviews suggest that the products are genuinely interesting and not cheap Chinese knock-offs - always a fear because of the perceived Chinese propensity for flooding markets with cheap products of indifferent quality. If our assessments are accurate, assembling the full range will be a solid place for DSK-Benelli to start though the lack of reach will initially be the big hurdle that Benelli and DSK will have to tackle. Luckily, DSK is fresh with the experience of building the Hyosung network and should be able to sort this out to a reasonably good level quickly. What remains to be seen is the quality and acceptance of Benelli in India. They are a big brand to be sure in historical terms but their relevance to the current motorcycle world is largely thin on the ground - attributed to a globally small reach more than any specific product issues. Coming to India - and if they are successful - should give Benelli an unprecedented boost in both volume and profit. On the other hand, this is DSK's second motorcycle adventure with a relatively small brand. The risk with that is of being pigeon-holed as a corporate organisation that works with these small, almost boutique brands. On the face of it, there is nothing wrong with that as a business model. A number of organisations do boutique-oriented business trading in volume and market share for bigger margins. But is that what DSK aims to do in the motorcycle business? Futher, neither Hyosung, nor Benelli are automatically perceived as either luxury or exotic brands (the same issue that Vardenchi has to tackle in India with Moto Morini . However, while Hyosung already had a perception in India thanks to their dalliance with Kinetic, Benelli is a clean slate that DSK Benelli can use their marketing and branding skills to create a fitting image of, one that works for the products. Again, Vardenchi has the same advantage with Moto Morini as well. I think the real question is how DSK-Hyosung's image affects DSK-Benelli, if at all. Benelli has to be positioned as a more premium brand because it is, after all, a European brand and that, in India, automatically makes them more luxurious than a Korean brand. But the game DSK are likely to choose to play is on the price front, by assembling the bikes here to keep prices well below the established names. Which, in effect, is the game DSK-Hyosung is playing. Will a premium European brand find success playing by the rules of an affordable Korean brand? We wait for this story to begin on October 17. And we most certainly cannot wait to ride the bikes. The 300cc BN as well as the 899TNT are the one's I am eyeing.